An epic tale of war between dragons and mankind! When the mysterious dragon slayer Bitterwood murders the son of the Dragon-King, the dragons respond with a campaign of genocide against their human slaves. Amid the chaos of war, a band of rebel humans risk everything to fight for freedom, and an end to the Dragon Age. Read the saga that Orson Scott Card called “a magnificent hero story.” Bitterwood, the Complete Collection gathers together all four novels of the Bitterwood series, plus the prequel short story “Tornado of Sparks." Tornado of Sparks: The dragon Vendevorex demonstrates his magical powers for the dragon-king Albekizan in a test that orphans a human infant. Can Vendevorex reunite the child with her only remaining family? 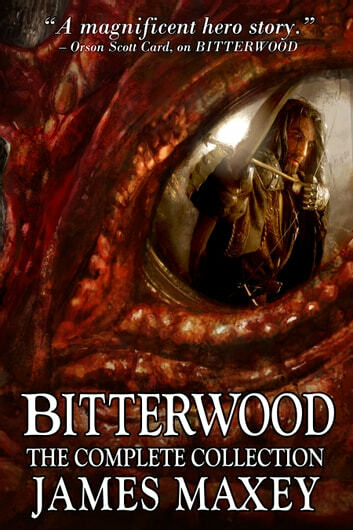 Bitterwood: Dragons rule the world and humans serve as their slaves, pets, and prey, with only the mysterious dragon-slayer Bitterwood fighting the dominant dragons from the shadows. But when Bitterwood slays the beloved son of the dragon-king Albekizan, the dragons launch a war of extermination against all humans. Can mankind survive the combined might of the dragons? Dragonforge: As a war spreads throughout the dragon kingdom, a band of human rebels take over the armory of the dragon armies, the legendary Dragon Forge. As the dragon armies mass to take back the fortress, Bitterwood finds himself in the fight of his life, facing off against the most dangerous dragon of all: Blasphet. Dragonseed: With the dragon forces in disarray, the humans face their own woes as allies banded together to fight the dragons begin to take up arms against each other. With all of civilization on the verge of anarchy, can Bitterwood save the day by joining forces with his worst enemy—the sun-dragon Hex, the last surviving son of King Albekizan? Dawn of Dragons: 1000 years before Bitterwood, a man named Alex Pure gets disemboweled by a dragon. It’s the beginning of a beautiful friendship. Also, the apocalypse. I paid $1.18 for this book. I feel like I hve stolen from the author. These books are wonderfully put together, leading you one way and then revealing unexpected twists. There is a sense of light humour that runs through the tales. Do yourself a favor and buyit. Wow. This story took me a little while to get into, but once I did, it wouldn't let me go. I loved the characters (and hated some of them... in a good way) It had some very refreshing and satisfying twists that left me wondering and hoping my questions get answered in the next two books! Dragons & Angels- Good Read!! Mr. Maxey has put together a fabulous work, with amazing turns that you would never guess! Crafted together with great characters making you want to see it through to the end. I really enjoyed this series & will read more of his work.